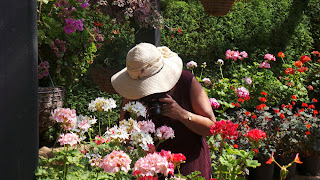 We went to the Geelong Botanic Gardens on Monday was to see the pelargoniums. 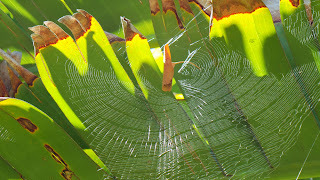 It was a stunningly wonderful surprise to see the giant ferns and palms decorated magnificently by the webs and retreats of lots of Australian leaf curling spiders (Phonognatha graeffei, family Araneidae). All photos were taken by Damian Kelly. These incredible spiders weave a part orb web and then draw up a leaf to create their retreat. They choose a fresh leaf from the ground below their web site, and then haul it up. Spiders have been witnessed lugging leaves up to four times their own weight. When in place, they stitch and tension the leaf, the tension in the silk curling the leaf into a cylindrical retreat as it dries out. Drier leaves are harder to curl breaking easily as the spider tries to bend them. 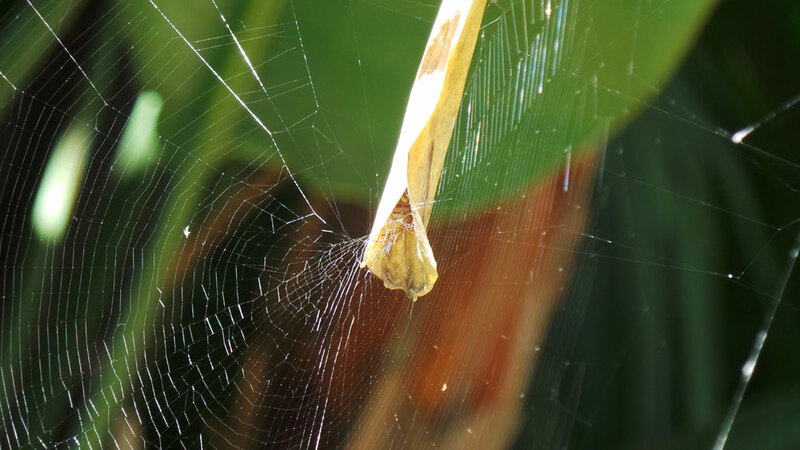 Research with leaf curling spiders has shown they select their leaves very carefully. Under test conditions, some decided, later in the weaving process, to remove a dry leaf to replace it with a moister, greener leaf. 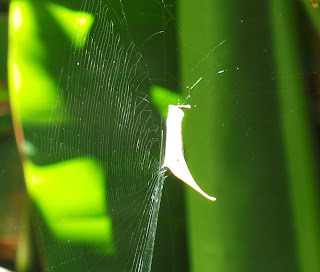 When a tad on the lazy side, or fortunate enough to have the opportunity, a leaf curling spider may choose to haul an empty snail shell into the web instead. Look how beautifully she holds onto her web with her front legs. 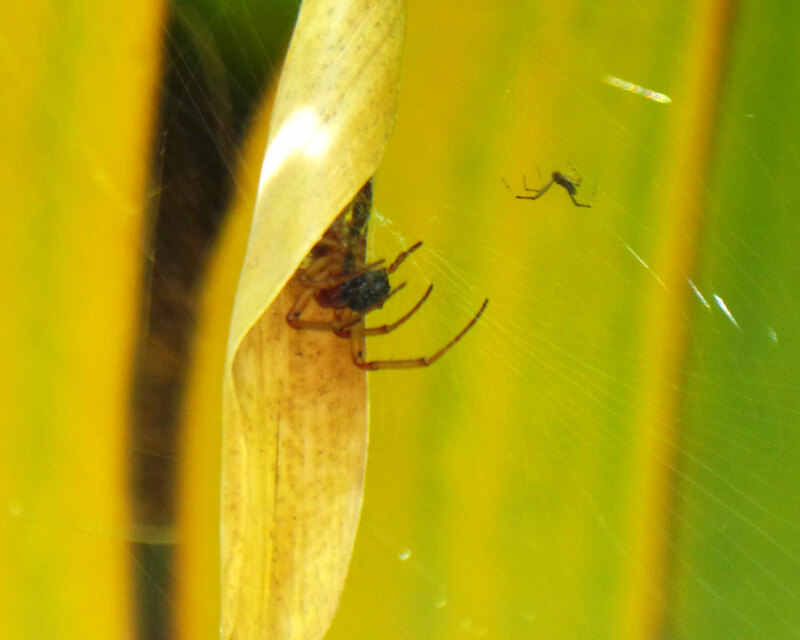 I suspect the smaller spider is a male approaching the female's leafy retreat. The males cohabit in the leaf retreat with immature females, waiting for her to moult. During that vulnerable window, he mates safely. Males will also cohabit with mature females and respond agonistically to rival males. But it’s not all rosy for the male Phonognatha. Females may eat him anyway. 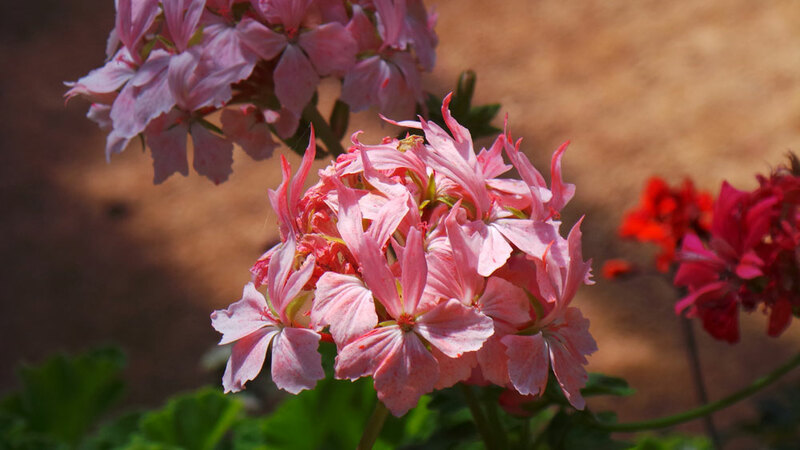 Oh, and while we're talking about the wonderful Geelong Botanic Gardens, here are some of their pelargoniums. 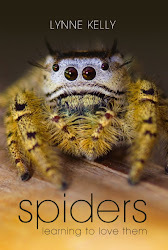 The only thing I enjoy photographing more is spiders. It is indeed. Thank you for commenting.